Marketers planning to promote products and services through bulk messaging plan to buy out subscribers to one of the earliest Reliance Communications Ltd (RCom) calling plans that offers unlimited free text messages. India’s second largest wireless service provider RCom introduced what it then called the Dhirubhai Ambani Pioneer Scheme, offering unlimited free text messages together with national long-distance calls at 40 paise a minute, as a means to attract customer when it launched its services in 2003. The scheme, which has a monthly rental of Rs400, is no longer available to new subscribers. Several RCom subscribers to that plan last week received a text message from a website, Funonphone.com, offering Rs1,000 for transferring their subscription to the scheme to a client of the website. “Our client sent the message using our software," confirmed Nikhil Talwar, Nashik-based promoter of Funonphone.com. The website incidentally sells software that costs Rs6,000 for sending bulk messages. “If you want to terminate your Pioneer scheme, then we will pass the lead to our client." He clarified that his client, Clifton Miranda, a Mumbai businessman, would offer the money, and Funonphone.com would only pass on the lead to him. Miranda has already acquired one Pioneer subscription a couple of months ago by sending such messages to RCom customers. “I sell weight loss and weight management products and need to remind my customers," said Miranda. He said he had got the numbers of the subscribers to the Pioneer scheme through a friend who works in RCom. The Pioneer subscriptions, he said, would be transferred to his name. “I need this scheme for messages; SMS will be free for me," he said.“I also wanted to buy another scheme in which people could actually call Reliance number 24 hours a day for free," said Miranda. “Reliance had many such schemes earlier, which are now not available." 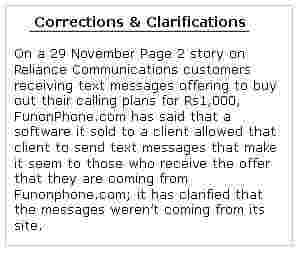 In an email response, RCom said that it has no association with Funonphone.com. “Reliance Communications would like to retain its prestigious Pioneer customers," it said in the email, adding the matter brought to its notice would enable it “to take suitable action". Mint could not immediately ascertain the number of subscribers under the Pioneer scheme. It had a total of 32,493,945 subscribers as of October this year.